Although a few provinces still report H7N9 cases more-or-less when they find them, since February of 2015 real-time reporting of China's cases on a national level has pretty much vanished. Since then, the National Health and Family Planning Commission (NHFPC) has taken to making monthly bulk announcements, with zero details. A more complete report is eventually forwarded to the World Health Organization, and their report can often fill in some details, but rarely to the degree we were getting just over a year ago. Keeping track of provincial announcements, media reports, and bulk releases from the NHFPC is Sharon Sanders and her team on FluTrackers, who maintain the most complete line listing of H7N9, H5N1, and MERS cases available online. Overnight Sharon picked up the latest announcement from the NHFPC (see below), where - buried in the middle of a line list - we find 17 H7N9 cases (7 fatalities) were reported to national authorities during the month of March. Of those, 11 were previously picked up on the FluTrackers H7N9 Line List. March 2016 (at 0:00 on March 1, 2016 to March 31 24), the country (excluding Hong Kong, Macao and Taiwan, the same below) reported a total of 575,400 cases of legal infectious diseases, died 1544 people. Wherein, the CPI infectious diseases as plague, cholera incidence and deaths have been reported. B infectious SARS, polio, highly pathogenic avian influenza and diphtheria morbidity, mortality reports, the remaining 22 infectious diseases were reported incidence of 331,932 cases, 1522 people died. 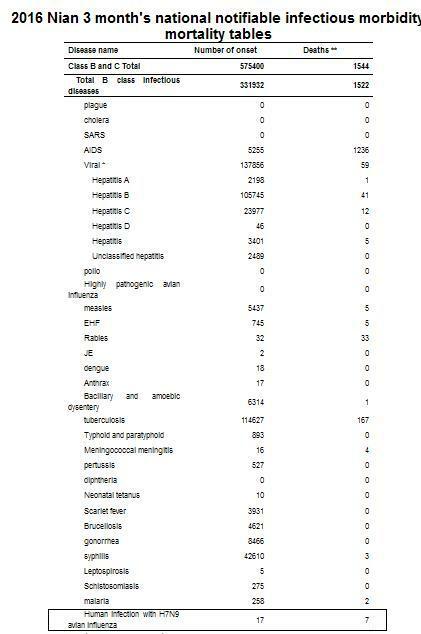 Before the reported incidence of the top five diseases were viral hepatitis, tuberculosis, syphilis, gonorrhea, and bacillary and amoebic dysentery, accounting for 93% of the total reported cases of class B infectious diseases. Over the same period, the country reported a total of 243,468 cases of Class C infectious diseases, the death of 22 people. Wherein filariasis morbidity, mortality reports, the number of reported incidence of the former three diseases were other infectious diarrhea, influenza and foot and mouth disease, accounting for 94% of the total reported cases of class C infectious diseases.